Another acrostic, showing the tone of the time, 1873. 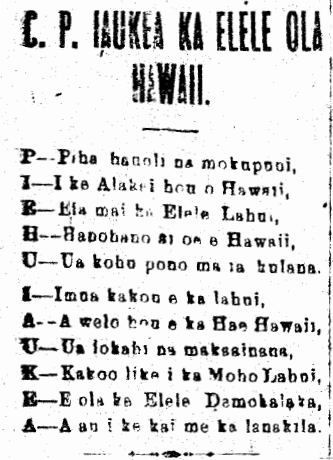 Acrostic Poem for King Lunalilo, 1873. Nuhou, Volume 2, Number 23, Page 1. October 14, 1873. The Prayer of the Lahui, 1893. KA PULE A KA LAHUI HAWAII. A—lana ia no ko ke ao nei. I—ola ai makou ma Ou ‘la. 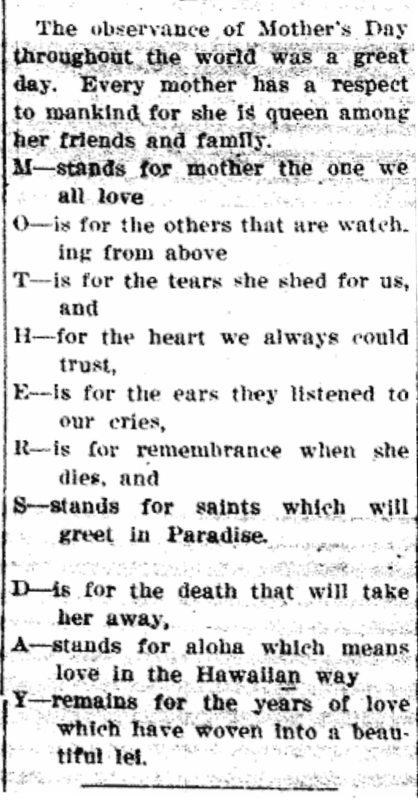 Acrostic Mele for the Home of Emma and Joseph Nawahi, Homelani, 1894. O Kalaniopuu i ka uluwehi. Ka Leo o ka Lahui, Buke II, Helu 1080, Aoao 3. Dekemaba 18, 1894.